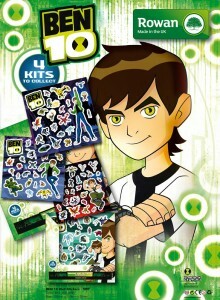 Ben 10 Stickers have become increasingly popular at Classic Sign. The favourable newcomer, Ben 10, is now admired by children everywhere. You can find lots of Ben 10 themed merchandise on the market today including comic books, card games, toys, video games, bedding, footwear… the list goes on! With the series being so evidently successful and well-liked, it’s completely understandable why our Ben 10 Stickers are in such high demand. Many children wish to have their bedrooms themed around the animated character, which is where our Ben 10 wall stickers come in handy! There are 4 vibrant packs to collect of Ben 10 himself plus his fellow animated characters, creating great memories from the show! You can put the stickers on any smooth, dry surface just so long as it’s clean! Did you know that you can even remove and reuse them? That’s right, and you’ll be pleased to discover they don’t even leave a trace on your decor, our stickers don’t leave behind that annoying sticky residue! Great for the kids and parents alike! We manufacture all our stickers right here in the UK, therefore you can be certain that they are suitable to use around your home and business, and especially for the children. We take pride in conforming to En71 quality standards and always use the very best quality inks and materials. No matter where you are in the world, we deliver to you and you can even benefit from discounts on multiple purchases. If you order all 4 Ben 10 stickers sets today, you can get a great price reduction!